Our range of products include wires pvc compound, cables pvc compound and wire and cable pvc compound. 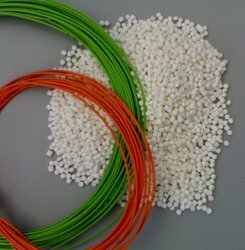 We are Leading manufacturer and suppliers of PVC Compound for Wires.Their dielectric properties make them perfect for sheathing & insulating electrical, telephone and allied cables. Our range is also appreciated for insulation, sheathing, flame retardant sheathing, flame retardant & low smoke. 7. Thermal Stability At 2000 C m inute 1 55 min. We are leading manufacturers of PVC compounds for wire & cable applications. PVC compound for wire & cable applications include many wire & cable categories as per British,IS,JIS & ASTM standards. Products includes sheathing compounds & insulation PVC compounds. High temperature resistance insulation compounds, compounds for various electrical applications like, Plenum, automobile cable, building wire & hose hold wires, power cables, welding cables are few examples of high quality PVC compounds manufactured by us in this categories. 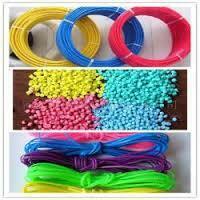 We are leading manufacturer of PVC Compound for Wire and Cable.